Riviera Nayarit, located on the Pacific west coast just north of Puerto Vallarta, is one of 31 Mexican states and is regarded as home to some of the world’s best bird watching locations for vacationing birdwatchers, especially during the months of October through to March. Bird watching opportunities abound everywhere in Nayarit, from Sayulita to the San Blas mangrove eco region including the San Pancho and El Pozo Estuaries, Peso Island, and the La Tovara Nature Preserve and Bird Sanctuary. 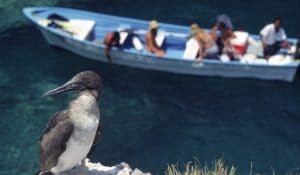 Bird watching in San Blas is a dream come true for every bird lover. The area around San Blas Nayarit, which is less than 2 hours from Puerto Vallarta airport, boasts up to 7 different types of ecosystems. The many natural estuaries and coastal mangrove inlets and coves provide a tropical home to as many as 250 endemic species but as much as 80% of the bird population during the winter months consist of migratory birds from North America. In Sayulita and San Blas you’ll find many professional and reputable bird watching tours. These are fully guided Mexico birding tours where you’ll learn from very knowledgeable and experienced local bird watching tour operators who will help you to see and identify many bird species you may not be familiar with. Don’t be surprised if they also point out some of Mexico’s many crocodiles and turtle species, especially if you visit the La Camelota or El Manantial Crocodile Reserves. If you are a true bird watching enthusiast, a good time of year to visit San Blas Nayarit for birding is during Mexico’s Festival of Migratory Birds, which is held annually between that last week of January and the beginning of February. During this time you’ll be able to take in some excellent environmental conservation seminars and bird watching presentations by some of the world’s best wildlife experts, as well as professional bird watchers (Ornithologists). Another bird watching event worth considering during your Riviera Nayarit vacation in December is the annual San Blas Christmas Bird Count. Watch a YouTube video about bird watching adventures in Riviera Nayarit. Visit our land activities page to explore other incredible Riviera Nayarit adventures like the Sea Turtle Release Program.